I have been outta the blogging loop for a few months and am now catching up on my reads...You still never cease to amaze me. This is a beautiful look! I always look forward to seeing your awesome work! Wow, that's really lovely! The gold looks great with the black, and the pink lips are pretty. Did you use an even mixture of those two lipsticks? Very lovely! I, myself, am a 'Puff and this look gets me right in the feels. I love the yellow / gold! I've been looking for something like that. Gorgeous! I love black and gold together. 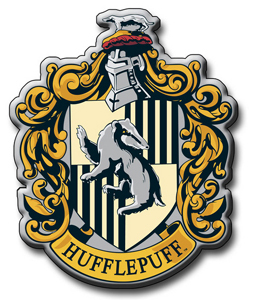 I was sorted into Ravenclaw, but I was only one point away from Hufflepuff. Excellent look, by the way! Thank you! I wish I was in Ravenclaw! I recently made a Pottermore account as well and was also surprised with my sorting; I landed in Slytherin. I love that you're doing Harry Potter series and can't wait to see your Gryffindor Look! And, if you've seen the Harry Potter musical? You're also an especially good finder! Like this GORGEOUS FIND of a look!